The game servers work around the clock. Usually, there is a restart of all servers at 02:00 UTC+0 or 03:00 UTC+0 (depending on Daylight Savings), which makes them unavailable for around five-ten minutes. Downtime is sometimes lengthened if major maintenance is required. There are multiple methods to enter the game. You can use any that you prefer. These alternative methods can be found below. The following is one of the most common and easiest methods, entering Tanki straight from your browser. You can use the following direct link to access the servers from your browser. If you end up using the HTML5 online version of Tanki and want to revert to using Flash, or for whatever reason you wish to use Flash, use the following link. If you want to try the HTML5 version of Tanki, or you can not run Flash for whatever reason, use the below link. Note: HTML5 is still a relatively new technology. Not all browsers support it, thus if you experience errors try using another browser or updating your existing one. Attention! HTML5 version of Tanki is still under active development and testing by the developers. You may experience bugs / glitches. All you need is a browser to play - no downloads or anything. There may be more lag on a browser compared to the client or Standalone Flash player. Just copy one of the following links, go to File → Open → and paste it. Direct link for accessing Test Server. After you enter a link for the first time it is saved in the menu. 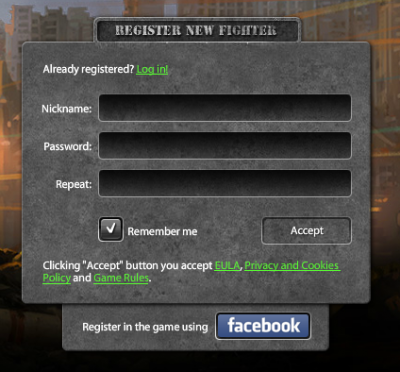 You can join the battle using a browser. Then you need to copy the URL from the address bar and open it using Standalone Flash Player. In this case you get right into the battle. You can be invited by a friend who is currently in the battle. Unfortunately, joining a specific battle by clicking a link to it isn't possible on Standalone Flash Player. However, you may send a private message containing the link to yourself in chat and join the battle that way. Go to File → Open → Select a Server link from the list and paste it. If you use Windows it is possible to create separate shortcuts to make the Flash Player automatically go to the necessary server. To do this, you need to create a shortcut leading to downloaded file called "flashplayer_25_sa.exe", then open its properties, find a line called "Object:", put a space just after the name of the file and enter the link of the server you need. Note: The standalone version of Flash player saves cache in Internet Explorer’s temporary files. In "Properties" window, you will see the word "Destination". Paste the link of the server you want (one of those listed above) into that field. Tanki has its own reliable and optimized client which anybody can obtain. 1 Download the client. Check to ensure that you meet the System Requirements. 2 Open the installation package (double-click) and follow the on-screen installation wizard. (Windows). Note: Mac users download the client program itself, thus for them no installation is required. 3 Now that the client is installed, simply launch the client by selecting it from the Start Menu, or searching for it. The client is usually faster than the other methods of entering the game. Battle links may become a hassle as the client has no address bar to enter battle links. The easiest way to get around this to send yourself a private message in the chat with the link to join. You can send yourself a private messege by typing Yournickname: followed by the link. Issues tend to be more common in the client than in other methods of entering the game, such as a browser. Error #2124 Re-install and update your Flash Player. Payment page issues Use a browser instead. This method of entering an account is only possible for users who have an existing Facebook account. 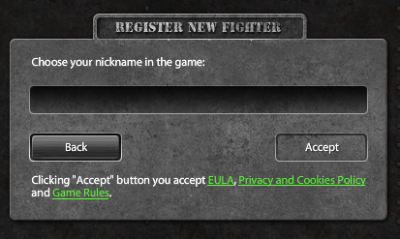 2 When linking your account using the entry screen, you will need to enter your Tanki Online nickname and password once again, in order to prove that this account is really yours. 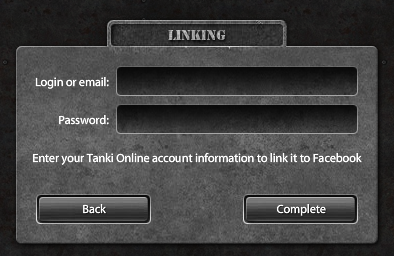 Note: You can only link one Tanki Online account to one Facebook profile. If you want to unlink your TO account from Facebook, simply go to Settings and click on the Facebook icon. 1 Everyone who enters the game for the first time will see this form. 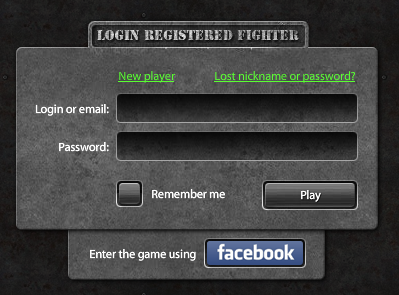 Note: It is not possible to choose a password for a Tanki account created on Facebook. 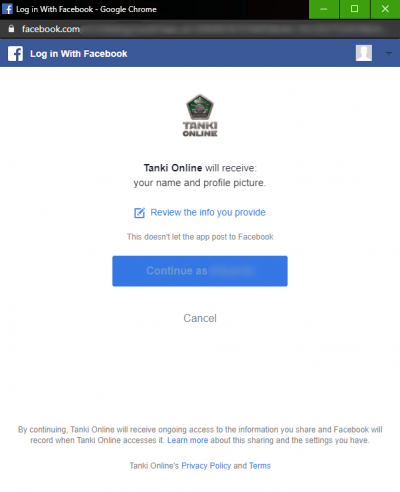 Thus you will only be able to play Tanki from this account via Facebook. If you want to have a password set for your Facebook account, contact Tech Support. 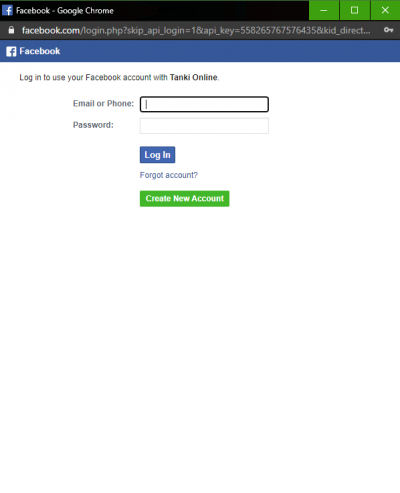 Choosing the password is not possible when creating a new Tanki account through Facebook, you must contact Tech Support to request a password which will enable you to login via all the other login methods. Miniclip is a third-party gaming site which can be used as an alternative to all of the login methods listed above. Use the following link to access Tanki Online on Miniclip. Miniclip is a 3rd-party website which the availability of cannot be guaranteed. Attention! Miniclip is a 3rd-party website, and therefore Tanki Online is not responsible for its availability or maintenance. Steam is a popular third-party gaming site which can be used as an alternative to all of the login methods listed above. 1 Create an account on Steam here. 3 Open the installation package (double-click) and follow the on-screen installation wizard. 4 Now that the Steam client is installed, you can launch it by selecting it from the Start Menu, or searching for it. 5 Ensure that you are signed in on Steam, then click the "Play Game" button here to load and install Tanki on your Steam client. Steam has features for screenshots, etc which can be useful at times. Steam is a 3rd-party website, and therefore Tanki Online cannot its availability or maintenance. Attention! Steam is a 3rd-party website, and therefore Tanki Online is not responsible for its availability or maintenance. This page was last modified on 9 March 2019, at 16:55. This page has been accessed 328,194 times.